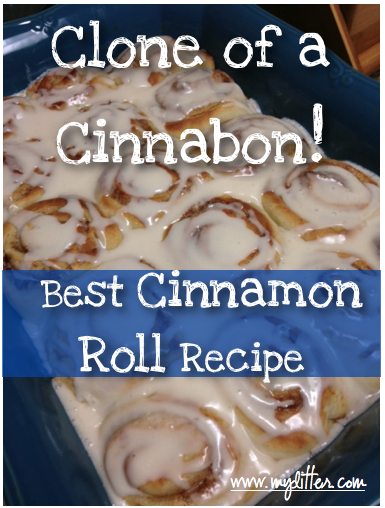 Home » Homemade Cinnamon Roll Recipe – Clone of a Cinnabon! Homemade Cinnamon Roll Recipe – Clone of a Cinnabon! June 21, 2016 By Tiffany 156 Comments By clicking on our links, we might make a SMALL commission - Thanks for the support! See our full DISCLOSURE here. Last night I got the urge to make homemade cinnamon rolls because it was so rainy and ugly out, it seemed like the right thing to do! Plus, we had company coming in and I thought it would be a nice welcome from a long drive. O.K. who am I lying to? I just wanted to eat some! Cinnamon Rolls are so easy to make, they just take a few steps, so give it a shot and don’t let them scare you! Mix 1 quart Whole Milk, 1 cup butter, and 1 cup Sugar in a pan. Bring almost to a boil, just “scald” the milk. If you boil you went too far, it will curdle the milk. Remove from the heat and let it cool until warm. Add 2 packages Active Dry Yeast, 0.25 Ounce Packets and mix in. Now transfer to a bowl all the liquid, then add 8 cups of flour, 1 teaspoon (heaping) Baking Powder, 1 teaspoon (scant) Baking Soda, and 1 Tablespoon (heaping) Salt. Cover with a tea towel and let rise for about an hour. After it has risen, turn out to a floured surface ( like above) and add about 1 more cup flour while kneading it all in. Take about 1/2 of the dough and roll it out into a rectangle. I would say 18 inches by about 9 inches or so. Cover with a thin layer of melted butter, sprinkle liberally with cinnamon and then sprinkle with brown sugar. Starting with the long side away from you, roll the dough up towards you. Fold the dough up and close the roll by pinching it together. Now take the sharpest knife you have and cut the roll into 2 to 2 1/2 inch sections. Now place them in a greased pan almost touching each other. Let these rise about 20 minutes and put them into the oven at 400 for about 15 minutes. Pull them out when they start to get golden brown, let them cool for just a few minutes, and pour frosting over the cinnamon rolls! For the frosting, you might have to add more milk or even more powdered sugar to get the right consistency. You want it thick but pourable! 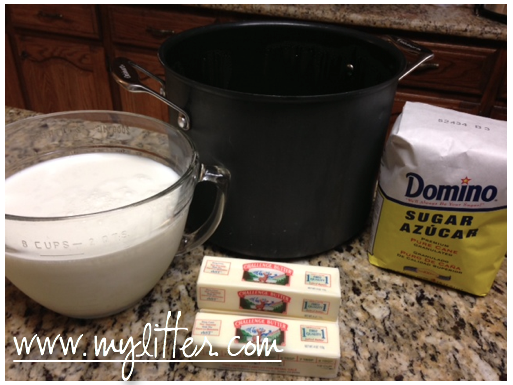 Mix 1 quart Whole Milk, 1 cup butter, and 1 cup Sugar in a pan. Bring almost to a boil, just “scald” the milk. If you boil you went too far, it will curdle the milk. Remove from the heat and let it cool until warm. Add 2 packages Active Dry Yeast, 0.25 Ounce Packets and mix in. Now transfer to a bowl all the liquid, then add 8 cups of flour, 1 teaspoon (heaping) Baking Powder, 1 teaspoon (scant) Baking Soda, and 1 Tablespoon (heaping) Salt. Cover with a tea towel and let rise for about an hour. After it has risen, turn out to a floured surface ( like above) and add about 1 more cup flour while kneading it all in. Take about 1/2 of the dough and roll it out into a rectangle. I would say 18 inches by about 9 inches or so. Cover with a thin layer of melted butter, sprinkle liberally with cinnamon and then sprinkle with brown sugar. Starting with the long side away from you, roll the dough up towards you. Fold the dough up and close the roll by pinching it together. Now take the sharpest knife you have and cut the roll into 2 to 2 1/2 inch sections. Now place them in a greased pan almost touching each other. Let these rise about 20 minutes and put them into the oven at 400 for about 15 minutes. Remove and cover with frosting! Cuisinart 9×13 insulated baking pan Nonstick. 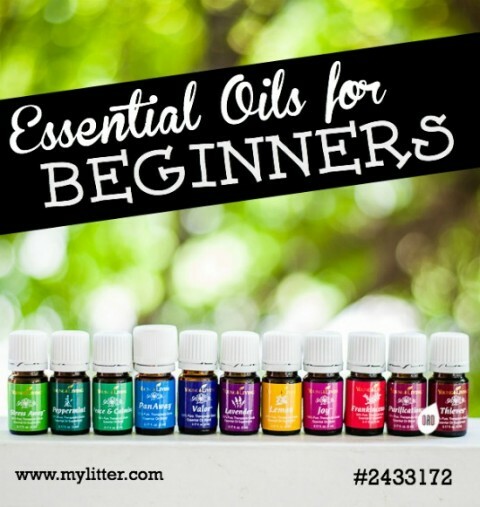 Are you wondering what all that talk is about essential oils?! I can help explain it HERE. They look delicious, much better than any cinnamon rolls I’ve ever made 🙂 Did you think about doing a cream cheese frosting? Can I use self rising flour? Would I need dry yeast still?? I don’t think you would need as much? I need to read a bag and see what the flour says…. If you use the self rising flour you will not need to add baking soda and baking powder but you will still need yeast. Cause yeast is different from the other too. Your dough will not rise before putting them in the oven. Exactly right on the lemon extract, NOT vanilla. THAT’S the secret to The Cinnabon cinnamon roll! Can you cut the recipe in half? There are only two of us! Im gunna make these with cream cheese frosting!! 😊😊mmm! ill it work the same way?? Ooooh so want to try these yours look so good. I tried to make a batch from another recipe for the first time a few months ago and they were good but not quite the perfect cinnabon quality. This one sounds like just the ticket!! If you find cutting them with a knife to be smashing the dough, you could use an undyed piece of thread, string, or unflavored floss. Shimmy it under the dough and cross the thread and pull. It cuts the dough w/o added pressure to smash it. Old trick I used to use. Can you explain the yeast part to me—2 packets AND .25 oz of the packet? I will be using the jar stuff so just trying to clarify. Thanks! 1 packet of yeast = 1 Tablespoon of yeast. numbers, carbs, etc? My family would love this!! No I don’t know the nutritional numbers, honestly I really dont want to! 🙂 It makes 2 9×13 pans for me. After cutting them up& letting them rise for 20 minutes, could u freeze one 9x 13 since it makes so much.? thank u very much for the great recipe! Hi, love this recipe. Trying it out now. If I do freeze some already risen, what is the procedure to bake them afterwards ? Straight from frozen into the oven gen or let them thaw first ? Thanks from France ! Do you store the remaining dough? If so, how. They look so yummy!! If you want to do it that way, store the dough before you roll it out and make the cinnamon rolls. Put the dough in the fridge and pull out in the morning and go from there . Or you can make the pan or rolls and then freeze them. Pull out and unthaw and bake. If they’re frozen, and you unthaw them, they’ll still be frozen. I am just writing it up now!! I will opiated it in the morning! My favorite recipe!!!!!!!! I am so glad wonderful chefs like you are kind enough to share you wisdom with the world. People like you make my day glorious!!!!!!!! Thank you for making me and my tummy happy. I just saw your reply on IG. Yay!! I can’t wait! The cream cheese frosting from Cinnabon at the mall has a smidgeon of lemon in it. My daughter works there. I have been trying to duplicate it for sometime. Oh good to know! Let us know if you figure it out! Mine didn’t rise right 🙁 Good…but tough and chewy? Your yeast could have been dead or old? Or it could have risen too long or been killed if it was too hot. Just thinking why it wouldn’t rises correctly… anyone else have any ideas? Make sure that you liquid is between 100 – 110 F. If it is much above this it will kill the yeast if much below this the yeast will not activate. Ya…maybe it was too hot…oh well, my first attempt making any kind of dough from scratch! Don’t give up!!! Once you get the hang of it a few times you can make anuything with yeast and bread is soooo good! This recipe brought back memories for me…..Years ago when I worked in a restaurant in PA I had to make these every other day….they sold like hot cakes…. When you said take 1/2 the dough and it roll out, what do you do with the other half? I am assuming you make another pan full? Wow! I can’t wait to try this. Do you think I can use wheat flour? Yes you can, just do 1/2 and 1/2 I have done all wheat flour and they were not great. My daughters and I made this recipe and it was a hit . My husband and son really loved them. I tend to look for baking recipes on websites and when I saw how delicious they looked, I decided to give it a go. I am more of a cook than a baker, but my whole family agreed these were the best we have tasted. Thanks for sharing. This is a keeper! Can this be made with 2% milk? I LOVE cinnamon rolls and have never tried homemade ones so I would love to try making them. These look great! How many rolls does each 9×13 pan make? How many rolls does it Mae per 9×13 pan? It just completely depends on how thick you make them and how wide you cut them! You can make giant ones or small ones totally up to you! If I make these tonight (except baking), could I just refrigerate the ready to bake rolls and bake them in the morning? Was looking through many cinnamon roll recipes today and am so glad I chose to make yours, Partly because it seamed to be the easiest to follow! I’ve only ever had cinnabon in Kaula Lumpur as I live in Australia, but yum yum yum! Thank you so much for brightening our winter day with this really yummy recipe. We are enjoying them right now! Do I stir everything together after I add flour and rest of dry ingredients to yeast mixture or not? It doesn’t specify to stir before I let it rise. Can you use butter instead in the Cinnabon Frosting? Is the cream cheese lite or regular? Would love to know the answer to this question also. I have a feeling they would probably rise too much but it would be great if you could. Made these tonight. I actually cut the recipe in half so I wouldn’t have to cook two batches. They were so good! Thank you for sharing! A good and easy way to get milk to temp is to microwave it for 3 minutes, then add butter & sugar. By doing this it brings the temp back down and then it’s not too hot for the yeast. Can I use my kitchen aid with dough hook to make this dough? These turned out super awesome, and I am definitely adding this recipe to my baking arsenal. One question, though – do you have any tips if the recipe turns out a bit doughy? I’m having trouble telling if the rolls are done or not, since the parts with the buttery spread are moist and dense generally. I cooked one batch in a cast iron pan, and they definitely didn’t seem done on the inside. Another batch I cooked in glass pie plates did better, but I just wasn’t sure. Working on my 1st attempt with this recipe…I Googled, Cinnamon Rolls as the husband has been after me for a few days now…once the weather got a little wet outside, I guess that means it’s fall and he wants food that sticks to his ribs. 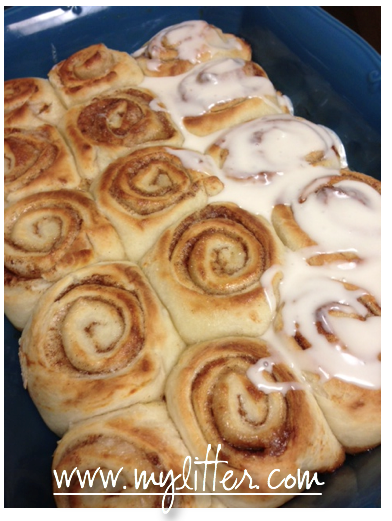 Thanks for posting this recipe…I’ll let you know how they turn out! What size is your bag of powdered sugar? these cinnamon rolls are DA BOMB!! Frosted after the rolls has cooled…then hit the cinn roll in the microwave for about 10 seconds and eat!! YUM!! 😀 Super Happy (sugared up) kids & hubby! Oh good I am so glad! Baking these now & the dough after mixing in the flour is still batterish. Is that normal? Can you use coconut milk instead? I have dairy allergy. My husband is a nut fanatic. I usually add raisins and nuts to my buns. Brown sugar and margarine on the bottom of the pan. I make a lot of my own bread and buns, so I just make a double or triple batch and make cinncannabon buns at the same time. I made these twice now. LOVE THEM, and real easy to make. Definitely learned that they do indeed need to touch while second rise and bake time. Otherwise the vertical spirals of the dough go flat and or fall. great and easy recipe. very good taste! I made them last night and brought them to work. Evorobody loved them. They were grait. The only change I made was the cooking time. They did not look ready after 15 minutes so I baked them for 25. The best recipe ever, thank you soooo much! These are so yummy, made them multiple times already and they always go VERY fast! Thank you so much for this recipe!! The only thing is that I add much more flower (about 2 cups more) as I find the dough very very thin otherwise. But works great with the extra flour! Tried the rolls for Christmas breakfast. Tastes great, didn’t cook quite right. Maybe lower temp, longer time? Maybe make 6 rolls in a smaller pan, like Cinnabon? The center rolls were mostly raw. But again, delicious! I see you used the rice cooker for this recipe. Is that to rise the dough? I have never thought of that and have a rice cooker. What setting would you use? Keep warm? Would a slow cooker on keep warm work too? My new oven doesn’t get low enough so this is a new thought I would like to prayer further. Oh my goodness, I see that at the bottom! That is in the wrong post! However… you might be onto something! I, personally, am not a fan of cinnamon rolls because of the lack of cinnomon, frosting, and overall moisture. But! I LOVE these! I just made them this evening along with Cream cheese Frosting and I love them. Thanks for the recipe. I made these, but instead of spreading butter on the dough I used sweet condensed milk, and added about a cup of chopped nuts to by brown sugar mix. They turned out like a sticky roll. Really good! OMG! I have made these twice now… In a week. 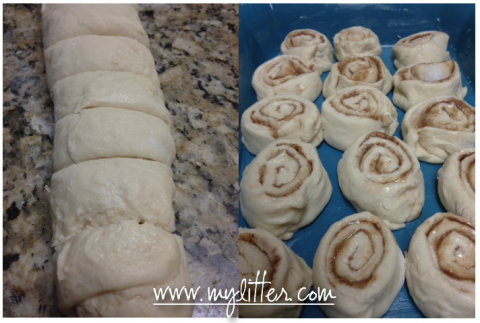 First thing first, this recipe will yield about 30 rolls! Don’t even bother trying to half the recipe,otherwise you will regret it in the end. My second batch, I cut the recipe in half and it lasted all of 10 minutes. Now, I was not very happy with the first batch because they were a little chewy,so I made a few tweaks in what I did the second time around. Use a kitchen thermometer to temp the liquid. Do not add the yeast until the liquid is 110 degrees. When I added the dry ingredients to the wet, I just mixed enough to incorporate all of the ingredients . Since it is January and I live in Washington,I don’t have the ideal climate for proofing (allowing the dough to rise) so I turned my on to 400 for just a minute or two, then turned the oven off and put the bowl with the dough in there to proof. Don’t be impatient! Give the dough about an hour to double in size. Next, I used my kitchen Aid mixer to knead the dough while I added flour 1/4 cup at a time to stiffen the dough to an elastic state. Then I let the dough hook knead for about 5 minutes. I pulled the dough out and kneaded by hand stretching the dough a little each time…then instead of rolling it out, I continued to stretch it with my hands, much like you would a pizza crust. I thought, perhaps rolling it is what caused the chewiness the first time. When it was as thin as I wanted it,I pulled it into a rectangle shape. I used a half sick of melted butter to wash the dough and then was generous with the cinnamon and brown sugar. I rolled it from the long side. To cut the rolls, I used a white piece of thread. I placed them in a buttered glass casserole dish, put them back in my oven (heated as above for proofing) and left them there for another hour before pulling them out and preheating the oven to 400. I cooked them for 15 minutes. So, long story short, be patient!!! These definitely aren’t something you can just whip up; but they ARE DEFINITELY worth every second it takes to make them. I topped them with the cream cheese frosting listed above, minus the lemon juice because I didn’t have any. Beating the frosting for at least 12 minutes is also a must. It makes for a very smooth icing. These cinnamon rolls literally melt in your mouth! Thank you so much for the awesome review!!! I try and tell people how good they are! It says to cut the dough in half in the recipe, and then it never mentions to repeat the following with the remaining dough. So will all the cinnamon buns fit into 1 baking pan or do you need to use 2 baking pans? Thanks! Thank you!! Your suggestions are very helpful! recipe calls for? Thank you. Can you freeze them? If so do you still let them rise and freeze before baking??? A few people have asked how much is “one bag” of powdered sugar but I couldn’t find a reply. Can you give a measurement in weight or volume? Thanks. Powdered sugar comes in a 2 lb bag. Do you mix the ingredients to make the dough before you you let it stand to rise? I’ve made other cinnamon rolls before it always said to kneading for ten minutes then let stand to rise. I love to bake. I would like to make this rolls perfect. Now i can satisfy my unbearable Cinnabon cravings! Just wanted to ask can the recipe be halved? Also whats your instagram id? Easiest recipe and total delight!!!! Everyone loved them!!! I am in love with this recipe!!! You rock!!! can you make these one day and bake them the next? Great recipe,enjoyed by all at my house! You mention letting it rise only after you put in the last of the bread ingredients but you don’t say to mix them in. Are you saying that you don’t mix in the flour, salt, baking soda, and baking powder? You just let it sit on top of the liquid for an hour? Or did you mean to write in that you stir it all together first? It’s just like any recipe, you have to mix things together. Can I use pizza yeast or no yeast at all will it be the same ? you must use yeast. Pizza yeast is faster rising but it should work. In the ingredients you list “butter” & “melted butter”. Are these salted or unsalted butter? Or does it really matter? I’m eager to try out this recipe and want to make sure I have all the right ingredients before I start! These were really yummy I tried them and they came out good! I read someone in a previous post said that Cinnabon puts lemon in their frosting so I tried it. I put two drops of lemon essential oil and it tastes AMAZING! Can I made them today & bake them in the morning? Thinking about making these at my place for Christmas Morning. This sounds silly, I know, but I don’t want to have these for days on end. My sister LOVES cinnamon buns on that day; I am tired of the name-labeled, trans-fatty cinnamon buns, so I want to do something different for my family when it comes to that. This has been a tradition of my father’s for multiple years, but I would like an update. If you can cut the recipe in half, that would be great! Just finished making these and they are delish!!!! Easy to follow directions. I used the kitchenaid mixer for the first part, perfection! Two full Pyrex 9×13 dishes worth of buns. I used margarine instead of butter for the icing (just because I ran out of butter) no problem. may I suggest you change the recipe to include instructions to stir the ingredients together? At first I just followed your picture of letting the dry ingredients sit on top of the wet ingredients, since your recipe said nothing about blending. About 5 minutes later I mixed everything together, thinking it couldn’t be right to just put ingredients in a bowl together. Now the dough seems chewy and is not rising. I’ve used yeast in a lot of recipes so I’m not sure why this recipe isn’t working for me. These look delicious! I was wondering if it would be okay to make the dough in advance , like the night before, and just store it in the fridge overnight? Rolls didn’t rise due to yeast being killed in cooling scalded milk. Wasn’t till after that I discovered milk liquid for yeast has to be between 100-110 degrees. After 20 minutes in oven outsides were perfectly brown and insides were extremely doughy. Will try again but more clear directions for recipe would make making these rolls much easier. The parts of the rolls that were cooked throughout were delicious. use a piece of plain dental floss to cut the rolls works really well. just slide the 12 inch piece underneth the roll to the spot where you want to cut, bring the end together and pull. it a trick i learn in culinary school. i followed instructions exactly and when I went to put everything in to make the dough and let rise it seems the consistency didn’t match up. Seems like there’s too much flower needed or used. Did I do something wrong? I mixed all ing and doesn’t look right . Looks too floury. Will this still rise? This is the best cinnamon roll recipe ever! I have been using this recipe for the past year. I’ve made them for partys and even used them for fundraising. Everyone loves them.Thank you so much for posting this recipe!! I’m gonna trying to do here in Brazil! I hope i have all ingredients! Can I make the icing ahead of time and refrigerate or freeze? I’m making things to put in my brothers freezer (new single father). silly question what’s a quart of milk in cups? Yasmin 1 quart = 4 cups, and there are never any silly questions in cooking. Hi — great sounding recipe. About how long does it take from start to finish? If I don’t have whole milk can I use 2%? I had high hopes & made these this morning. My instincts were 9 cups of flour to 1 quart of milk was way too much. Unfortunately, I was right. I followed the recipe perfectly, & I ended up adding so much extra flour, the cinnamon rolls were more like rolled cinnamon biscuits. The icing: same findings; the vanilla was way too overpowering, & the recipe made twice what was needed. In the future, I’ll use 1/2 the milk in the dough & about 1/4-1/3 the vanilla in the frosting. Better luck next time, I guess. how many servings? sorry for the question. i’m just curious. it looks sooo yummy i’m going to try it out. i love baking. Well ladies, I haven’t read all of your comments about this cinnamon roll recipe and like you couldn’t wait to make them. I swear I followed the directions to a “T”, but after where I was supposed to get to the “dough” stage, I had a sloppy batter. I wound up putting 5 more cups of flour to even get it to the “dough” stage. I am pulling them out of the oven now and they look like the County Fair Cinnamon Rolls. If I get the courage to make them again, I will use only 2 cups milk. I love this recipe been making it for a few years.I have never had a problem with it.If you are new to working with yeast use thermometer Milk should not be over 115 it will kill yeast. I like chilling my dough before I roll it out. They look amazing. Any chance you could post a recipe with metric quantities. I am in South Africa and we use metric measurements. You are awesome. There are 8 of us in my house, and recipes are never large enough for all of us. Thank you! 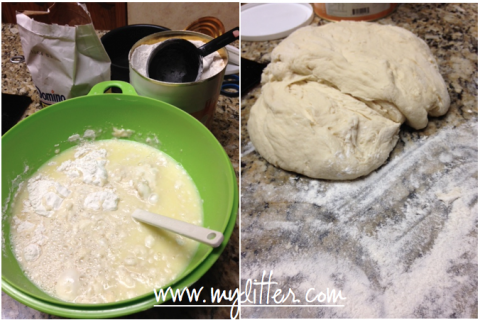 Can I prep the dough the night before and knead and finish recipe the next morning? I’m a little confused about taking half the dough and roll it out. Is this a two batch recipe?